North America sets all-time record snowfall in November | Watts Up With That? December 10, 2018 in records, snowfall. This is a likely occurance when the sun is in full minimum phase. Ralph, stop applying logic to a purely political movement wrought with hand wringing emotion. It is times like this that the emotional Warmist comes forth to remind us that we cannot conflate weather and climate. These of course, are the very same alarmists who have been pinning hurricanes, wildfires, and the recent pandemic of impacted wisdom teeth. But wait, I jumped ahead of the curve. They won’t have the wisdom teeth computer model up and running until 2019. Stand by for heavy rolls and emergency extractions. Hand-wringing is key — KEY! It shows how much you CARE! How much you know is much less important. Uncertainty principles, modesty, humility, the ability to accept ambiguity or doubt — who needs any of those things? In the coalition of New Age Sensitive Guys & Hysterical Ninnies, all you really need to do is care. I don’t care. Does this make me Deplorable? I refuse to wring anything except a washcloth. I am simply glad that, despite the slop, slush and snow falling out of the sky like gangbusters and causing a major power outage in my kingdom, the power is back up and running. My kingdom is no longer in danger from Snowdragons, Ice Crystal drells, or that weird cave critter that bopped Luke Skywalker on the head and dragged him into its hole in the Big Drift. Actually, this is my over-reaction to all that warmist nonsense. Winter has not started yet. when no one else does? The Winter Solstice (Dec 21 in the Northern Hemisphere) is only one of many definitions of the start of Winter. For example, Excess Winter Mortality in the NH is typically measured starting from Dec. 1 through March 31. Other definitions of Winter are local and weather-dependent – e.g. the date when you take the brass monkey indoors. UPDATE – MY “COLD WEATHER CURSE” IS WORKING! BETTER THAN I IMAGINED. Actually if you look at the data you will see that at the last four solar minima, cover was average to less than average. Your statement is not backed up by the data. History bears that out. Strange we don’t hear more about that. Atmospheric water vapor has been increasing (graph https://pbs.twimg.com/media/Dthp4WEVYAAVv36.jpg) at 1.5% per decade, 8% since 1960, but few seem to recognize the significance of the increase (about twice that from increase in vapor pressure due to temperature increase of liquid water) on climate. How much of recent high precipitation (with incidences reported world wide) is simply bad luck in the randomness of weather and how much is because of the ‘thumb on the scale’ of added water vapor? On the other hand, climate models ovewhelmingly overestimate precipitation. Mic – GCMs got precipitation wrong also? Does anyone still doubt that GCMs are faulty? Climate science is the belief that averaging dozens of wrong answers will get you the right answer. 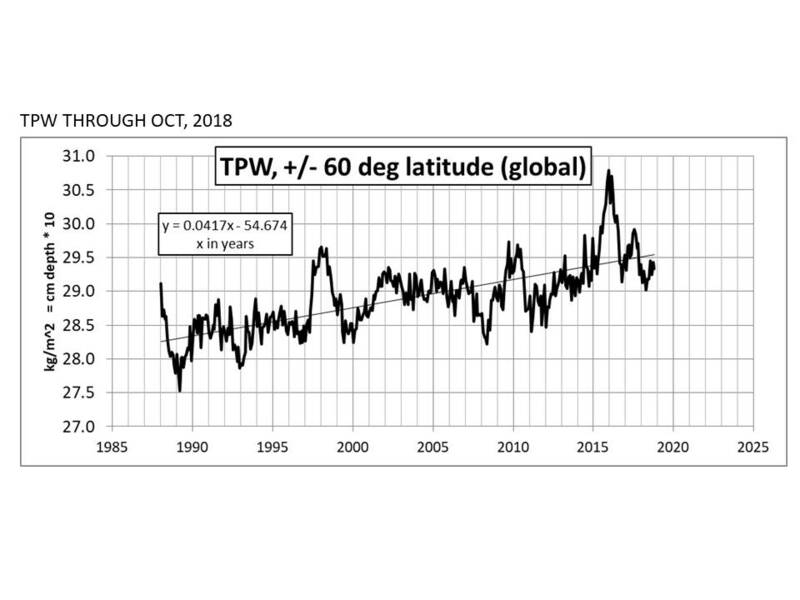 Is the government Agency that has been measuring and calculating the Global Average Atmospheric H2O Vapor ppm Increases …….. the same government Agency that has been measuring and calculating the Global Average Near-surface Atmospheric Temperature Increases? Surely it is, …….. and that would explain why their calculations are defining a 1.5% per decade increase in Atmospheric H2O Vapor. “DUH”, the Surface Temperature Stations also record humidity (H2O vapor). Iffen the temperature rises ……… the humidity is also likely to rise. Yes Dan: The IPCC has got itself into an awful logical mess. First it defined Radiative Forcing (RF) as a force ( pounds force) as in voltage in electrical terms. Next it converted this into an energy flux (approx 1.6 Watts/sq.m) This could only have been done by calculating the opposing force generated by a climate which the IPCC considered to be appropriate at the time and hence arriving at the resulting energy flux. One can now but wonder what that appropriate climate was and how it was created. Finally this flux is now taken as standard value to be applied to all other climates and further morphed into a temperature value by means of the Planck Equation (chngF = K*chngT) where the “k” coefficient is called the “Climate Sensitivity “ (ECS) This flux Meme, I suggest, is now incorporated into most of the models and is thus a root cause of their abysmal performance. Sadly for the IPCC not all climates are equal; and ECS varies greatly and possibly quickly such as with the seasons. As you rightly point out humidity considerations here come to mind as at phase change the ECS is zero as the process takes place at constant temperature; so this little nugget of fact really does muck up the calculation. Result? – Loads of Fudge methinks. Not surprising that the IPCC admits to not knowing much about clouds. It should ask the engineers! In practice the radiative force in opposition to the greenhouse RF is mainly generated by water as it goes round the atmospheric Rankine Cycle. But that is another story. SCC – I am using UAH for lower atm temperature. RSS v3.3 temperature corroborates UAH. 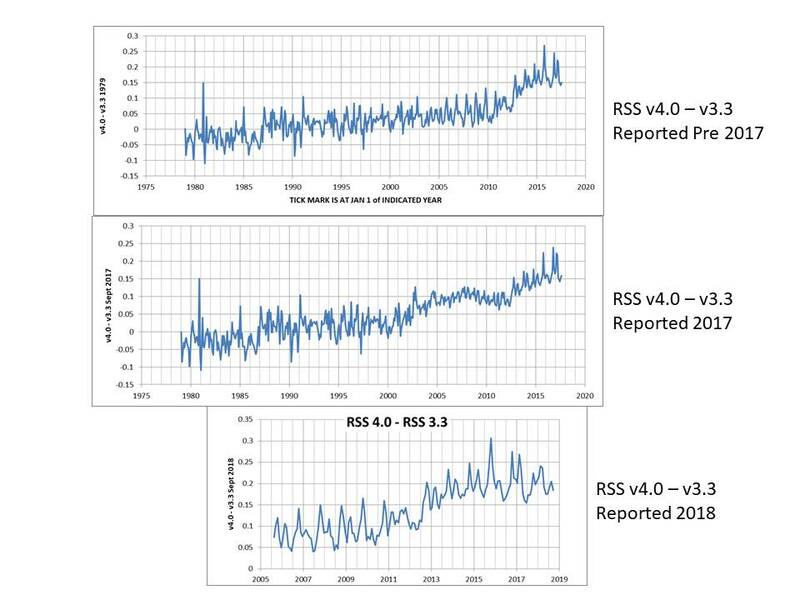 RSS v 4.0 appears to have drifted up about 0.2 K over the period about 1995 to 2013 https://pbs.twimg.com/media/Drpqhr-VsAANpZc.jpg. Slope trends of all measurements have been about the same since about 2016. WV has been increasing about twice as fast as calculated from vapor pressure increase resulting from temperature increase. Ah so, ….. by satellite, ….. the “magic eye” in the sky that can “see” and “count” all the different gas molecules in the atmosphere. The problem is, the satellite can only “see” the IR radiation ….. which is directed at it …. but then it has to guess as to what the origin of the IR was. The same thing with clouds, whether its satellite or radar, they can only guess as to how much WV they contain. Yes but it is the relative humidity, i.e., the sweat you develop on your balls when do are doing your sister-in-law!! Dan, interesting graphic. Where did you get your data from? Wim – Find your way through http://www.remss.com/measurements/atmospheric-water-vapor/tpw-1-deg-product and you get to the numerical anomaly data, through October, http://data.remss.com/vapor/monthly_1deg/tpw_v07r01_198801_201811.time_series.txt The last two digits are the month. When they publish a new month under a new link they delete the previous month. Oops, the latest data just changed and is through November. The link is correct. Yeah, I’m no government agency. I’ve been tracking local weather on my own for some time now, and I’m finding that humidity for this cold time of year has become MUCH higher and stays there than it ever was 10, 15 and 20 years ago. That may have something to do with the snow and/or rain loads in cloud formations, or it could be just a fluke, but if it continues, it is not a fluke. It is a trend to a new direction. This is how the great global warming scare will finally end. One by one people will realize that the world isn’t getting warmer. They may realize it early one morning while shivering on a cold street corner in Chicago waiting for a bus, or maybe they will quietly realize it while shoveling a heavy snow off their driveway in Alabama, or perhaps when their flight from Dulles Airport is cancelled because of snow one dark night, or maybe when they wake up one morning in Warsaw or Stockholm or Berlin and see snow outside their window. There won’t be any grand event to mark the gradual recovery of sanity. It will just be a slow one-by-one awakening. Many of the Hollywood elite, the politicians and the wise priests of the news media will continue to mechanically mouth the global warming mantras but the conviction will be gone. The apostles of this peculiar faith won’t admit they were wrong. They will simply stop talking about it. I have been saying for some time there will be a backlash from our youth when they realise their inheritance was blown on the ‘climate change scare’. We were all daft ideological kids once. We turned into mostly well adjusted adults. We now look back and thank our parents and grandparents for their sacrifices in two great wars (at least), I don’t think there will be many green grandchildren looking back with the same gratitude. We’re leaving them with vast tracts of land covered with wind turbines and solar array farms. And that by the time (in a few decades) that they realize what’s been done to them, those turbines and solar farms will mostly be a broken, busted, and rusted useless messes scarring their landscapes. Not to mention they will have broken, banned, and criminalized, any OTHER power sources. I also don’t think AGW will ‘go away’ – it will morph into something else. Remember the agenda behind it. And here in California we got a total of 8.6% of the total electricity demand yesterday from wind and solar.! And it doesn’t look any better today. Jerry and friends have spent $billions on these , of our taxes/ excessive electricity rates on theses losers. I wonder how they ever expect to get to 50% , let alone the 100% mandate ? The previous Thursday (12/6/18), just choosing a recent weekday at random, it was only 5.6% from wind and solar (PV+Thermal). They expect to get to 100% by taking a helluva lot more of your money. You obviously need to be paying more of your fair share (good luck finding the definition of that). I left when I had a chance. I’ll never go back to live there. Sadly you cannot unbrainwash. You heard the statement “ give me the child and I will give you the man? We need look beyond AGM. It is only one of the Western civilization destroying tools of the current marxist ideologically driven success story. So little makes logical sense yet it is happening. Go back to Critical Theory and the Frankfurt School to find the foundation of all the leftist inspired chaos in the Western world. Take a cross section of education establishments on both sides of the pond and just look at the politics of the average educator let loose on our most precious posession, our children. The deaths of 100 million people during the 20th Century on the alter of marxism have been quietly airbrushed away while the right is constantly being portrayed as unacceptable and dangerous. The left has taken over the middle ground and declared it’s proven bankrupt ideas as a success story and the only future for society. One way immigration, destruction of the religious cornerstone of Western values to be replaced by a medieval cult and an all pervading sense of guilt among the brattish children of the middle class who have been taught to hate their skin colour and be ashamed of their history which produced the pinnacle of human society we all enjoy today. In the US in the UK in Europe I hear concerning stories from parents with young children, children who being subjected to unrelenting leftist indoctrination in the place of education. The next generation of blind unquestioning believers is already rolling off the production line. Be concerned. The “voice of reason” is being drowned out by the “screams of political correctness”. The scientists themselves will have to die off. Some researchers have been so committed to certain positions for so long that it would be end to their professional dignity to admit they were wrong about… everything. They will take their beliefs to the grave. Excellent observation. Unfortunately, by then the rent-seekers, bureaucrats and NGOs, who have lived high on the Global Warming hog, will be onto their next sc@m.
All past environmental scares seem to have disappeared. when the old boogeyman was no longer scaring people. there was no global cooling — just in our imaginations. for the next boogeyman — I’ve volunteered to do research. I understand the University I got my BSEE degree from Texas Tech U from has 1ft of snow on the ground today. That’s a bit unusual for there. Alternative Projections: SNODAS fields are effectively grids of point estimates of snow cover. Estimates of SWE and snow depth, as well as other variables have no real areal extent. Therefore, projecting SNODAS output to a particular projection is unnecessary. Moreover, different users prefer different projections. For example, Federal agencies are likely to use the Albers Equal Area projection, while researchers may use an alternative projection such as the EASE-Grid. Given that SNODAS outputs are essentially point estimates, the decision to re-project and choice of projection can be left to individual users. While I understand the issue, I still dislike the look of this map, beyond the projection. This is similar to having say, sales of widgets by year (should be a bar chart) shown as a smooth curve. In a computer programming class (1965-66 ?) we tried several ways of making geographic cell data into a surface (using FORTRAN II-D). Many good programmers (coders) have done the job and, now, most viewers never think of what is going on to produce such maps. Temperatures in USA were low in September and, even lower in October. The combined change over these 2 months was a fall of 5F (or 2¾C) in the USCRN temperature anomaly. My brother and I, both well into our 70s and old enough to recall WWII, were discussing the winters of our childhood a while back. Both of us recall snow on the ground before Thanksgiving as a regular occurrence. When I was a kid, everyone had to walk to school in knee-deep snow, uphill both ways, starting a week after Labor Day. Never saw the grass until April. But you try and tell the young people today that… and they won’t believe ya’. For the last 4-5 years, central Wisconsin (Green Lake/Waushara counties area) has had snow and freezing weather during the week of Thanksgiving in November. I grew up in central Illinois. I used to like early snow back then. Now, not so much. Round up the usual suspects, Dept. This heavy snowfall is obviously caused by global warming. What sort of heretical, anti-intellectual miscreant could fail to notice? In fact, every inconvenient thing, truthful or not, is caused by global warming. Every weather event — another tornado, another tornado drought, another picnic rained out, even the ants at the picnic (See? They’ve migrated all the way here from Guatemala!) are caused by global warming. There was a time when individual events were only individual events, but now they are all manifestations of Gore’s, Hansen’s & McKibben’s Big, Fat, Hairy Vision of Evil. The solution? Act shocked — SHOCKED! Then close down Western Civilization, AKA Rick’s Café Americain. But Scientists have just issued a Report saying EXACTLY THAT. And then they follow it up with. Lighten up, Francis! I found this yesterday: 3 continents buried under the snows and ice of Antarctica. A graveyard of continents has been discovered in Antarctica. Three very ancient cratonic structures were found, the wreckage of plate tectonics from hundreds of millions of years of geological activity. One craton has geological similarities with some of Australia’s bedrock, while another resembles part of India’s bedrock. The third is an amalgamation of pieces of old sea-floors. The most effective thing the alarmists have done is totally blur the difference between weather and climate in public perception. The ski season is also getting off to a good start here in Tahoe. Squaw/Alpine was able to open several weeks ahead of schedule. One of the earliest ever openings for the KT22 chair. There, I said it: But my father always said that when you hear the words “that’s not fair” you are listening to a loser. I tell my three children – The only fair you get in life is the State Fair that comes in the fall. Wasn’t it that those ski resorts were extending season well into the June this year? Mammoth is frequently open until the 4’th of July and a couple years ago, they were open until mid August and even Squaw was open on the 4’th which has only happened a few times over the last few decades. Early June skiing is not that uncommon except in drought years. Although, even in the recent drought years, skiable snow persisted in the mountains all summer long if you know where to look. You just have to hike for it. Lately, I’ve also noticed a higher fraction of colder storms and less of the Sierra cement Tahoe is famous for. Chile’s ski season usually starts in June, but a couple of years ago, it started early – I think in May – which made the resort owners (and skiers) very happy, of course. Ohhhh mammmaaa !!!! … EXTREME weather!!! … Polar Vortex!!! Dogs, cats, living together oh my!! Only a NEW TAX on your sinful lives will SAVE THE PLANET!!! And the offering plate is NOT voluntary. YOU will PAY just as much as Tom Steyer! You WILL be FORCED out of your cars … and your BIG homes!!! Viva CHE!!! I’ll be happy to “pay” just as much as Tom Steyer does, considering that he makes a healthy profit from the Greencon! Nah. THIS will be blamed on ‘climate change’. Surely it must be fake snow. Or, because of global warming the snow flakes have expanded, so it takes less snow to cover more ground. There, on to the next catastrophe from a further 0.5 degree “anomaly”. Meanwhile in Katowice it is a lovely 2 degrees – I wonder how much coal is being burnt to keep all those United Nations Framework Convention on Climate Change delegates warm. November, being not yet Winter, is still a bit warm. Warmer air holds more moisture, so more snow. They’ve told us that reason so many times, you’d think everyone gets it, by now. Don’t you need cold air fo sno? 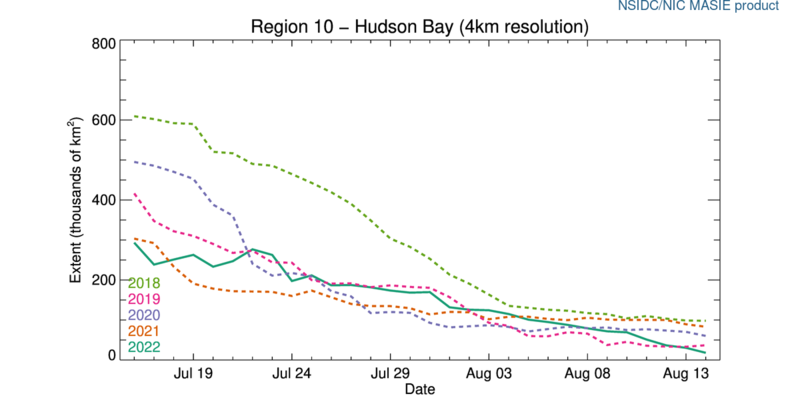 Yep, there’s that, but there’s the slow/weak Arctic PV formation (again) this year – because of the extent of open water. That allows more of a -ve AO (high pressure zones) there, pushing cold arctic air south. IOW: The N American continent has seen several transient cold waves … which (as we know?) will give snowfall as they mix with warm/moist air. Weather caused, ironically, by a warming climate trend. Surprising conclusion. I totally did not see that coming. However – I saw your “conclusion “coming”. No more open water than for the last 10 years, nice try though. Have you not noticed that the weather is not the same every year? Fascinating. If a trend supports your postion, it’s proof. On the other hand any trend that doesn’t support your position is meaningless. Predictable … the “with one bound” hypocrisy of the naysayer. A global temperature trend doesn’t cause weather. Weather is just hot battling with cold in order to arrive at a compromise, unlike the debate between alarmists and skeptics where the gap is so large, no compromise is possible and only one side can be correct. But how do you get stupid people to understand that? They told us for well over two decades that snowfall was starting later, ending sooner, and decreasing overall…and would just get worse. Once everyone “got it,” the data said they need to make a 180. For clarity… that 2 degrees in Katowice is in centigrade. Ja. It is globally cooling. Click on my name to read my report on that. Lapland has had almost no snow at all. Father Christmas is ….unhappy. Europe’s luck so far is about to turn. And yet 2018 will be among the top 4 or 5 hottest years on record globally… maybe even the hottest. Gavin already has his calculator warmed up. Bank on it. So one person is running the “scam” then? Charles will be after you. Global Warming… measured in feet not inches. As snow is now a thing of the past in the new catastrophic climate,obviously that white stuff lying all over the surface must be Global Warming. Of course on a planet dominated by water,where the multiple phases of this amazing molecule modulate the other inputs that create weather, it would be too simple to suggest that a slight cooling of the atmosphere might result in the dropping of some water vapour. It will get cold enough for snowfall in the north in a NH winter centuries from now (the hearts of continents get cold without the sun). If you allude to the daft scientist who said that “our children will not know snow”. He was talking of snow in the UK (not exactly frequent on low ground) and of children who may not yet have been born, and who even then would live ~80 years. But then … if you say so. “…He was talking of snow in the UK (not exactly frequent on low ground) and of children who may not yet have been born, and who even then would live ~80 years. What does it matter if they live to around 80? If they know what snow is as children, then they’ll know what it was as adults. Duh. “…According to Dr David Viner, a senior research scientist at the climatic research unit (CRU) of the University of East Anglia,within a few years winter snowfall will become “a very rare and exciting event”. Within a few years of 2000 is not something approaching 2080. The quote was used to support an article titled, “Snowfalls are just a thing of the past” and the article contains any number of anecdotal quotes to support such a thing. I’m sure you have evidence where Dr. Viner clarified his statements but have just neglected to post such a thing. He was talking of the UK. Many a winter has gone by for me without seeing a snowflake (low ground Midlands/E England). And why would those children have to be alive now? And why would those children not LIVE to see a UK climate in which snow would would be absent? That could easily be 80 years away from his words. Viner is not the IPCC. Just as stupid as the following ..
Monckton is not the naysayer community. An excellent “down the rabbit-hole comment well done. A goody even for here. Unusual cold for the month from Mexico-to-US-to-Canada contributed to this snowfall record in North America. I thought that snow was caused by warmth and moisture. Like we get in Cairns, Townsville and Darwin (only different)! Someone once posted on WUWT and it stuck with me … weathermans handbook says reduce forecast by 5F if there is snow cover. I’ve never actually seen the weathermans handbook but it seems about right. But, remember, the Cult of Climastrology came up with their Talking Point that human caused GHGs, primarily from fossil fuels, is melting the Arctic, which causes polar vortexes and other weather events that cause cold air and massive snow. Because cultists always find a way to prop up their cult. Anthony, while I like anomalies, I also like to see the actual data graphed as well. It gives me an idea of how significant the anomaly is relative to the magnitude of the actual phenomena. This applies to temperature anomalies, north pole sea-ice cover, etc. They all mean more when we can see the totals as well as the anomalies. Maybe this month should be called Novembuary? On the night of December 10-11, the Arctic air will fall to the southeast of the US. Snow will fall in Alabama, Georgia and South Carolina. Need FL to get a sweep of all 50! lts nice to see snow extent across the NH getting more attention, because its the one part of the global climate that is casting real doubt about the claims of the AGW lobby. lts said to be a warming world but yet the NH snow extent has been tracking side wards since the early 90’s. My 41 year recording of the date of the first snow in my local area is now showing a slight trend towards more early first snows, thanks to a recent run of early first snow. Along with other data it suggests that over the last 40 to 50 years. There has been very change in the timing of the onset of winter across the NH and maybe there is a trend is towards a slightly more early start to the winter season. Should have posted ” There has been very little change”. Just sorry that this natural cooling and snow has to hit poor yellow vest populations in France. 1) Norther Hemisphere Snow Extents increasing. 2) Greenland Land Mass increasing: NSIDC said 2017’s Greenland Ice Mass gain was a 1-in-100 year event. 2018 will also show a gain…. 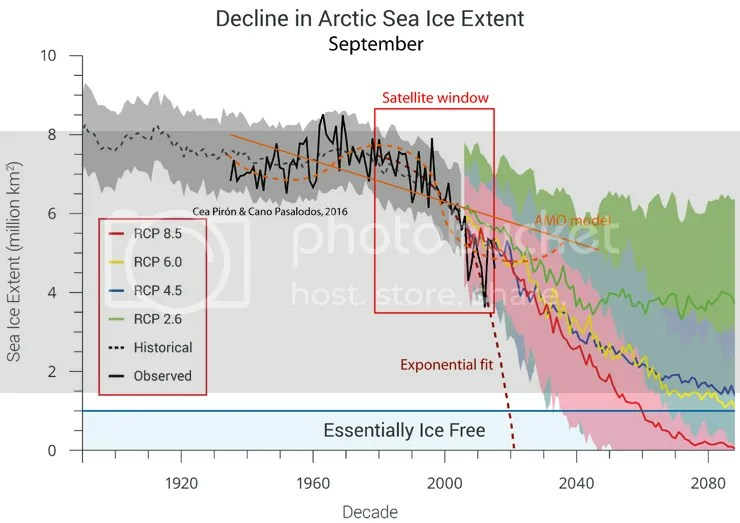 According to statistics, having two back to back 1-in-100-year events is a 1 in 10,000-year event..
3) Arctic Summer Ice Minimums haven’t significantly changed since 2007. 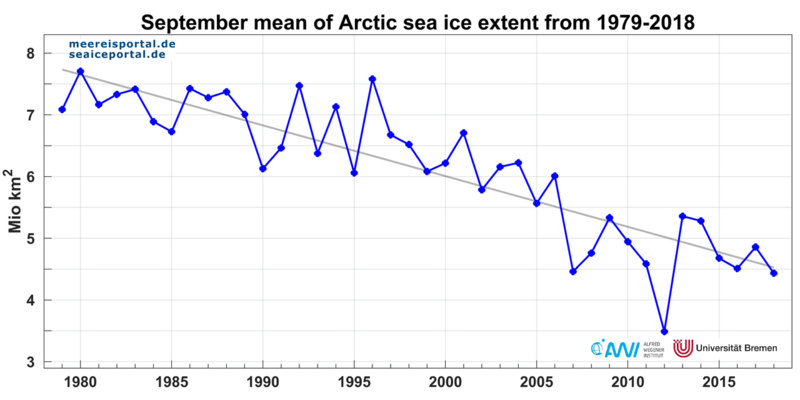 Some CAGW alarmists predicted the Arctic would be “ice free” by the summer of 2012… not so much. 5) According to NASA’s October 31, 2015 report, Antarctic Land Ice Mass has been increasing at 80~100 billion tons/year since satellite data started in 1992. 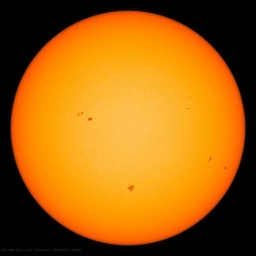 1) An approaching 50-year Grand Solar Minimum event starting from 2020. 2) The PDO, AMO and NAO are either in–or soon will be soon–their respective 30-year ocean cool cycles. The last time this happened (1945~1978), global temps fell for 33 years. This also happened from 1880~1910, which also led to 30 years of global cooling. On a side note, given the rapid increase of seismic activity around the world, I think a VEI5+ volcanic eruption will occur soon since the last one was in 1991 and these occur every 30 years or so, which will also generate a short-term global cooling spike. That’s the timescale of an interglacial. Good post. Hope we are both wrong. I predicted that natural global cooling would commence by 2020 to 2030, in an article published 1Sept2002 in the Calgary Herald. I am now leaning closer to 2020 for cooling to start, possibly even earlier. I hope to be wrong. Humanity and the environment suffer during cooling periods. I suggest that it is long past time for society to prepare for the possibility of moderate global cooling. 2. Reduce energy costs by all practical means. 4. Develop contingency plans should vital services be disrupted by cold weather events – such as the failure of grid power systems, blocking of transportation corridors, etc. 5. Improve home insulation and home construction standards. The current mania over (fictitious) catastrophic global warming has actually brewed the “perfect storm” – energy systems have been foolishly compromised and energy costs have been needlessly increased, to fight imaginary warming in a (probably) cooling world. I suggest this is the prudent path for Western societies to follow. It has no downside, even if global cooling does not occur, and considerable upside if moderate cooling does commence. My friend is no longer at the EIA, so I sent the above note and this one to the White House. Prior to the record snowfall in the winter of 2014–15, Joe d’Aleo and I sent a written warning to my friend at the EIA, stating that the NWS weather forecast that EIA used was extremely in error, and warning of a very cold and snowy winter to come, especially for the Northeast Coast. The EIA reran their lower 48 USA energy demand for that winter using Joe’s forecast and calculated an additional 11% total energy required for the winter months. The actual energy consumption were one percent lower than Joe’s forecast and 10% higher in the NWS forecast. That is a huge amount of energy. I do not know what contingency the EIA uses, so I don’t know if we saved any lives. Nevertheless, I believe we did a good deed and we may have indeed significantly reduced human suffering. In summary, if you want an accurate weather forecast, go to WeatherBell, not NWS. I share your concerns about the US electrical grid, which has been devasted by insane Leftist alt-energy policies and also generally poor maintenance of the grid. The US electrical grid isn’t even protected from EMP surges, which will have horrific consequences when (not if) the next Carrington Event occurs. I’m also concerned about cold-induced famines. During the Wolf Grand Solar Minimum (1280~1350), famines and exposure from brutally cold winters, late/early frost events, and shortened growing seasons wiped out 25% of Europe’s population, only to be followed by the Black Death (1352~55), which wiped out 50% of the remaining population. I’m not sure what government measures can (or should) be taken to alleviate the effects of global cooling on crops, especially in Northern latitudes, although GMO cereal crops with shortened harvest times would help. We live in interesting times, Allan-san. Allan, Sam – IMO you are (unfortunately) both right. Also, it appears that warming might have ended around 2002 with the last el Nino temporarily interrupting the flat trend. The slope change from uptrend to flat trend shows in the UAH trend https://pbs.twimg.com/media/DtNIoSoVsAAyOJ-.jpg I agree the downtrend should be apparent soon. Based on some earlier work, I expect the downtrend to be about the same rate as the circa 1990 uptrend of only about 0.2 K per decade. As to WV/precipitation, it correlates with irrigation increase so the precipitation trend is probably up to stay and we should enhance infrastructure to attend to it. CAnnot find this recent NIAC report on threats to the grid. A new government report warns that the United States would be woefully unprepared in the event of a catastrophic power outage, regardless of what the cause may be. The analysis was conducted by the President’s National Infrastructure Advisory Council (NIAC), a group of senior executives who are involved in the operation and maintenance of critical infrastructure. The NIAC found that the country’s current response plans for a “catastrophic” power failure — a widespread power outage that could arise without warning and last several weeks to several months — is not nearly adequate. So let’s put a whole bunch of intermittent, destabilizing wind and solar at the far end of the grid – what could possibly go wrong. Other states have done it, right? Let’s ask our friends in South Australia. Hello, South Australia? Hello? Hello? Hello? So let’s put a whole bunch of intermittent, destabilizing wind and solar at the far end of the grid – what could possibly go wrong? Other states have done it, right? 4 of the last 10 winters had -ve anomalies…. You are aware that snow extent is not a proxy for temperature? As in that extent increases at the margins where cold and warm air-masses meet. and over a snow field T2 temps may vary between just above freezing to as low as minus loads. As in warmer air is wetter and given a climate that has a -ve winter mean then even a 1 deg increase in temp of an air-mass near 0C would hold over 4% more precipitable water. It appears to be melting quicker/earlier …. Except for 2012 that is – which as an enormous outlier would be difficult to beat in the short term – Still on trend of the long-term decline….. 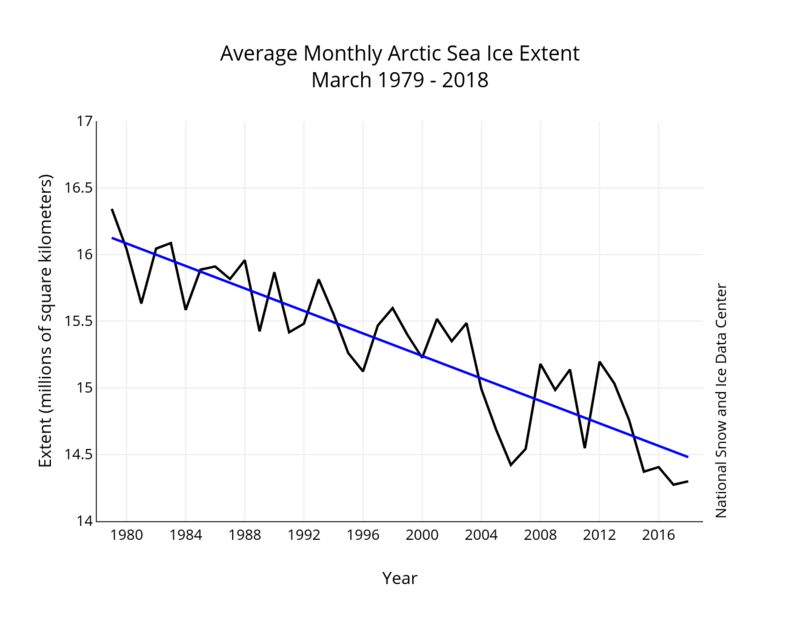 However greatest warming is occurring over the Arctic in Winter – and we see that in the decline in max extent in March …. No, one did – Wadhams. He isn’t the IPCC. This is the IPCC projection …. Just out and out blind denial …. This is more up to date …. 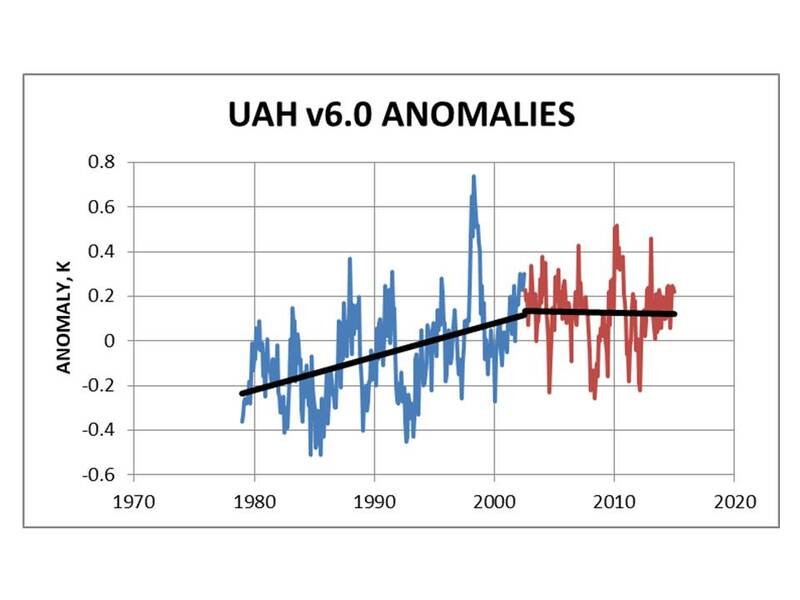 UAH is a massive cold outlier that estimates (by virtue of an algorithm) the radiances meassued by a single instrument – the AMSU onboard NOAA15 – which both does not agree with it’s predecessor MSU before 1998 and does not agree with both RATPAC A sonde data and ERA5 reanalysis. Another “interpretation” of it comes from RSS and that is much closer to the surface record (which comes from thousands of sensors). Additionally greatest warming is occurring nocturnally over land (under a surface based inversion) which the AMSU CANNOT measure. 1) Since the PDO entered its 30-year cool cycle, Norther Hemisphere snow extents have been increasing. 2) NSICD reported Greenland’s Land Ice Mass increased 46 billion tons in 2017, and about 20 billion tons in 2018. 3) Of course after NASA’s 2015 ICESAT report showing Antarctic Land Ice grew at 80 billion tons/year since 1991, they’d come out with a “new and improved version” that miraculously shows just the opposite… How convenient..
3) UAH is the only valid global temp dataset remaining… The others have added so much heat to raw temp data, they’re now rubbish. BTW, the UAH6.0 dataset match almost perfectly with radiosonde global temp dataset; HADCRUT, GISTEMP and RSS certainly don’t. Low temperatures (C) in the south of the US, as on December 11. El Niño does not help. I am puzzled as to why north America is mostly affected by the cold. And not Europe. 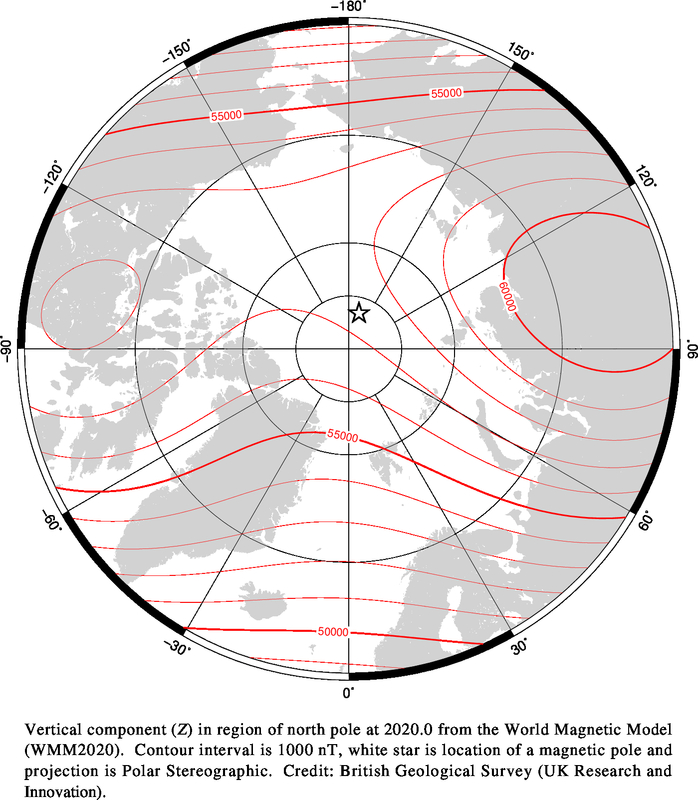 Look at the vertical component of the geomagnetic field. During the minimum solar period, the circulation coincides with the field lines. Look at the temperature distribution in the lower stratosphere. I’ll make the same comment that I make when the alarmists go on and on about heat records. Basically, the record doesn’t go back all that far. 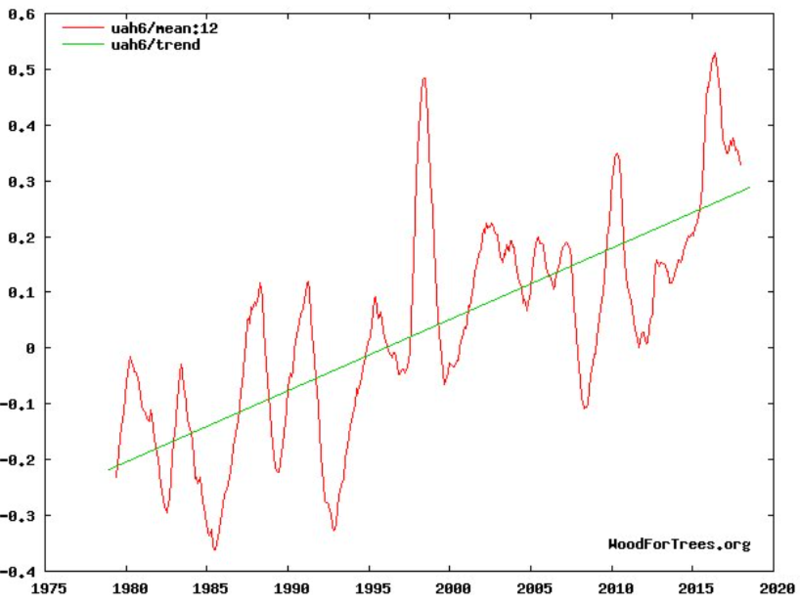 Of course this be down the AGW , you can frankly ask is anything not down to AGW, or claimed to be ? Earth goes back a LOT longer than records of snowfall.